Will Shakespeare. By John Mortimer. Perf. Tim Curry and Ian McShane. Dir. Mark Cullingham and Robert Knights. 1978. DVD. A & E Home Video, 2008. It wasn't the product description, which reads, "As he struggles to survive as a playwright, Shakespeare faces multiple obstacles, including the black plague and various personal tragedies, but defeats all obstacles to achieve unprecedented success in London." It wasn't Tim Curry, even though he's had a long and immensely varied career. It wasn't the enormous number of credits I've earned by placing links to amazon.com merchandise on the site. [In fact, I've just noticed that, since this blog went commercial in—oh, roughly July—I've earned a grand total of $0.25 from it. Twenty-five cents! But that's another story.] 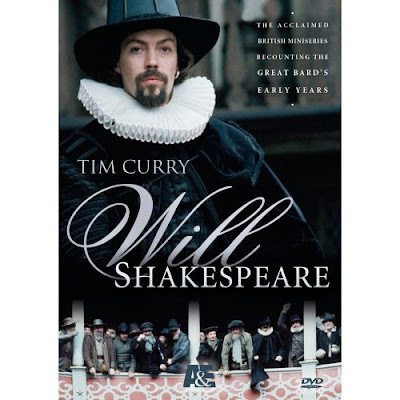 What was it, then (other than having some discretionary funds available for faculty development) that made me pre-order Will Shakespeare, a six-part miniseries that won't be released until December? Even though I still haven't heard a thing about it, I ordered it because it was written by John Mortimer, of Rumpole of the Bailey fame. If nothing else, it will at least prove to be interesting and funny—and, after all, it's Shakespeare! When it arrives, I'll give it a thorough going-over and a review. Perhaps I'll add a "biographical film" category to my Shakespeare and Film class this year . . . .
Buy a copy for yourself, using the link below! That will give me some credits to use at amazon.com to buy more Shakespeare-related materials to review for you! And the great circle of Shakespeare and film will continue!